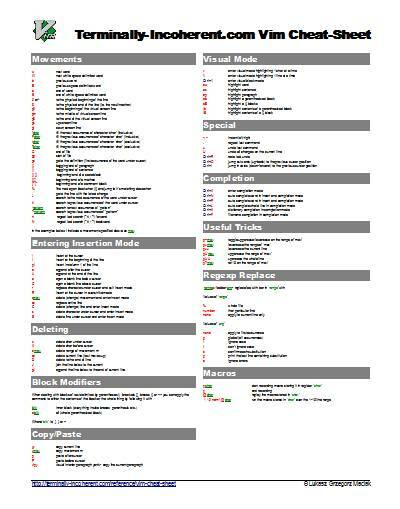 Some time ago, I posted a nice little Vim cheat-sheet here. It is sort of my personal sheet that includes the commands that I find useful, and that I forget about a lot. It is divided into logical task based groupings so you can find what you are looking for faster. The only problem with it was that it was not really written to print out nicely. If you tried printing it, it would probably span several pages and look ugly unless you copied, pasted and tweaked it a bit. Ok, so it is not the prettiest thing in the world but it has color and is more readable than the plain HTML list that I posted initially. I made it in Open Office – it was a spur of a moment thing, cause I needed to print it out and look nicely. I should have made it in LaTex but I was to lazy to look up how do you make multi-column layouts and etc. If anyone wants the editable ODT file that you can tweak, and modify (and possibly add your own tricks that I ommited) I can post that too. Just let me know – and be prepared to do some reformatting because you probably have slightly different set of fonts installed on your machine. Ah, the joys of WYSIWYG editors. Initially I started messing around with Scribus to do it the “propper” way, but it was taking me forever. If anyone wants to take a crack at it, and re-create using a more professional toolkit – please go ahead! I’d be happy to post the nicer version here and give you credit for it. This entry was posted in programming and tagged vim. Bookmark the permalink. Nice! I have been using Laurent Grégoire’s sheet, because he has a translated version to Portuguese. It’s more or less like yours, but it doesn’t spawn on multiple columns. I just tweaked the printer configuration to print two PDF pages in each paper page. Great stuff. I had to look through your previous post just last Sunday because I couldn’t remember a command. This is great. After a quick glance I don’t see any reason to ‘beautify’ it, except maybe to add to it. Thanks, I know this will come in handy (plus it saves me telling others how to do the basics). I will print and use this! I’ve been thinking of switching from my current combination of eclipse, geany and leafpad to Vim for a while but never got round to teaching myself. However in a lecture yesterday, the lecturer did a short section on Vim and that’s kick started me actually learning. Thanks for another well-timed kick. And great timing, last weekend I installed the jvi plugin on netbeans. You do have superpowers though… or a very, very small cubicle :-) I just printed the sheet and have it next to my kb, and I’am having a hard time to read it! Typo! tchar should be “next” instead of “previous”. Thanks for this! Can’t believe I missed this. thanks ! printed and in use ! Extremely useful and well laid-out. Hi, Thanks for the nice no, great cheat sheet. Could you please post the odt file? I have a few things to add and would like to try to shrink the margins.